In this game you take the role of a medieval prince trying to strengthen the power and prestige of your court. In order to achieve this goal you have to take care of your court in a lot of meanings (buildings, landscape, civil rights,...) to attract as many people and artists as possible to live there. 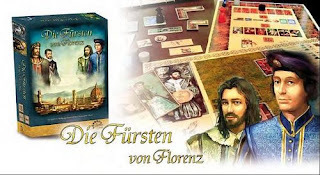 The box comes fully packed with a lot of material of high quality, both the different boards (scoring board and the boards for the players) and the other gaming material (buildings and landscape tiles, cards and markers) is manufactured really well. In the version published by Pro Ludo also two expansions to the basic game are part of the package. The game lasts for seven rounds, whereas each round is divided into two phases (Auction and Action). After the last round the game ends immediatly and the winner is the player with the most prestige points. In the first phase of each round (Auction) each player bids for some specific tiles (landscapes and builders, but also prestige cards) he needs to extend his palazzo on his playing board. In the second phase (Action) you can buy (and place) buildings, get certain bonus cards and most important, get professionists to complete some "works" at your court. Depending on the building- and landscape tiles on your playing board, as well as some other influences, this brings different (and overall most of the) prestige points necessary to win the game. The game is great. It is easy to learn, medium complex and the rules are quite clear. It is very well balanced which makes every decision really hard, but also gives you the chance to plan ahead and work on a strategy which might lead to victory. The influence of luck is kept quite low and even if there is not too much interacting between the players, there are also some mechanism integrated in gameplay taking care of this matter - and so the game overall plays really fluently and is exciting. Beside that it has a manageable amount of playing time (and just a little downtime for each player) ensuring that it will be played quite often - believe me. This game involves developing medieval and renaissance cities to attract various professions, which enriches the cities culturally. 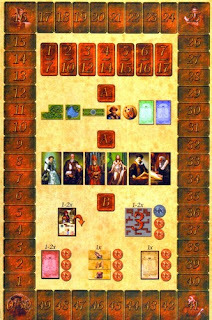 Each player is given a city grid and reference chart and attempts to gain the most victory points after seven rounds. Scoring victory points can be done in a variety of ways although most will be earned by playing profession cards to generate work points. There are a variety of professions such as astronomers, organists and architects. Each is attracted to a particular combination of building, landscape feature, and social freedom. The more the player can match these preferences then the more work points are generated. If a player satisfies the minimum requirement of work points, which increases each round, then the work can be created and the player can then trade the work points for cash and/or victory points. 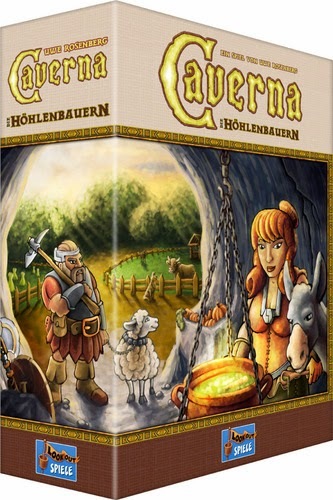 The original Alea/Ravensburger version is for 3-5 players, while the 2006 QWG version is for 2-5. In the new (2007) version there are also 2 new expansions. The game was released in this new edition in Holland, Belgium. Luxembourg, Germany, France, Poland, Italy and Spain. This game is #4 in the Alea big box series.